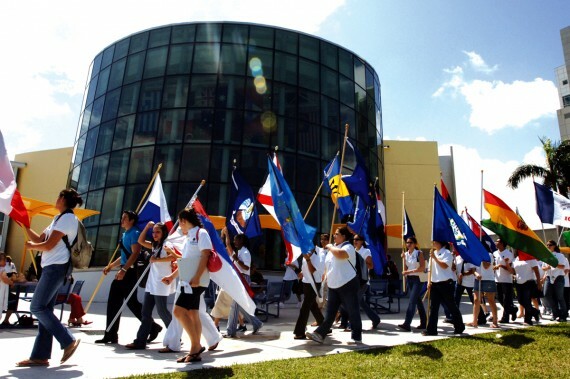 Florida International University is being recognized for its efforts in internationalizing the campus through its Global Learning for Global Citizenship initiative. Florida International University is being recognized for innovation in preparing its students for living and working in an increasingly diverse world. The Institute of International Education announced that it is honoring FIU with its 2016 Andrew Heiskell Award for Internationalizing the Campus in March at the annual IIE Best Practices Conference in Davis, California given the university’s game-changing Global Learning for Global Citizenship initiative. The Global Learning for Global Citizenship initiative is the cornerstone of the university’s approach – a two-course graduation requirement that engages all students in collaborative efforts to address complex global problems. The initiative grew out of an institution-wide effort in 2008 to reinvigorate the “I” in FIU. Today, global learning reaches every corner of the university, with students able to choose from a comprehensive array of more than 160 global learning courses, and participate in more than 250 global learning activities. This holistic initiative includes a robust professional development component for faculty, staff, graduate assistants, and student leaders, who receive online and in-person training and consulting to develop global learning courses and activities. One journalism professor, Moses Shumow, used a global learning faculty fellowship award to investigate immigration and cultural patterns in southeast Florida with some of his students. This investigation resulted in the creation of an interactive culture map of the area. For students, global learning courses and activities have been nothing short of life-changing. For example, participation in an online global learning course inspired Florenciana Dominguez to learn more about the anti-human trafficking initiative at the International Rescue Committee where she now works full-time. A five-week internship in Nicaragua facilitated by the Office of Global Learning Initiatives helped 19-year-old Ana Correa discover that her true passion was not advertising – it was helping international communities combat the threat of climate change. Even more FIU students have taken global learning to heart and have led the charge in addressing healthcare access from Miami or across the globe, mentoring young Haitian-American students in South Florida, or immersing themselves in global learning by living in residential the Global Living-Learning Communities on campus. FIU isn’t a diverse university. It’s basically all Hispanic. It needs more cultures from around the world, not just from neighboring countries. It needs more asian, middle eastern, russian, german, french, polish, romanian, nigerian, etc. If FIU is truly “international” it must live up to its name.